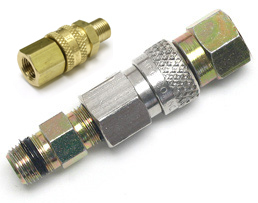 Air Venturi Quick-Disconnect Fill Adapter Set, Fits Many PCP Guns. .
Quick-disconnect fill adapter set fits many PCP guns! Forget the headaches of complicated air systems! We can adapt many brands of PCP gun, pump, compressor, scuba tank or any other high-pressure equipment to our custom adapter. Things I liked: The Quick Disconnect works great. What others should know: I had a little problem with air leaking only at the pipe theads, but with a little sealer on the threads ( not much) crank it tight, thereafter,no problems.